Bangalore : TRIO TOTS kindled the spirit of warmth and togetherness by celebrating Thanks-giving Day today at its Sahakara Nagar campus. The kids hosted breakfast for their nannies by arranging the dishes and serving them all with their tiny little fingers. Even they fed them just the way their nannies do for them on usual days, cheering out with “We love you, thank you” at the end to express their unconditional affection. With the kind cooperation of parents, children also distributed fruits among the supporting staffs such as security guards, cafeteria staff, electrician, carpenter, gardener, drivers and others. The fruits were offered only in cloth bag keeping in mind the importance of saving the Mother earth. “It has been our regular endeavors in TRIO to ensure that the students grow up to be caring individuals who spare a thought towards the less fortunate ones. 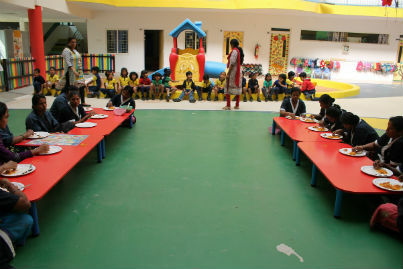 There are many people in their lives who play a silent yet significant role by providing a safe and hygienic environment for their holistic development. Today was a perfect day for the kids to show their gratitude and how much they mean to them. The support staffs were overwhelmed with the gesture shown by the little ones.” said Mr. Naveen K M, Managing Director, Trio World School.